Lightly grease a 8” round springform pan. Line base with baking paper. Heat oil in a frying pan, stir fry chopped bacon and ham till slightly golden brown. Add chopped onion and garlic, stir fry for a while. Add parsley flakes and stir well. Remove from heat, stir through honey. 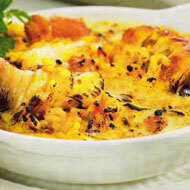 In a large mixing bowl, combine cooked rice, bacon and ham mixture, 1 cup of grated Mozzarella cheese and egg. Season with salt to taste. Spoon mixture into prepared pan, pressing down firmly so there are no gaps. Bake at preheated oven at 180c for 25mins. Remove from oven, set aside to cool. Remove the rice cake from baking pan. Sprinkle the balance of grated Mozzarella cheese on top of the rice cake, and bake again at pre-heated oven at 200c for 15mins or until golden brown.